I’m excited to share something special with you today. 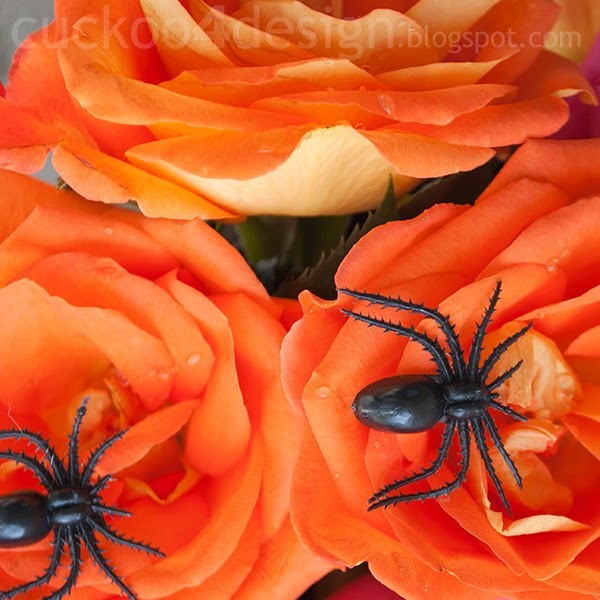 I’m participating with a great group of bloggers in the Halloween project extravaganza presented by Coupons.com. So what’s this all about? 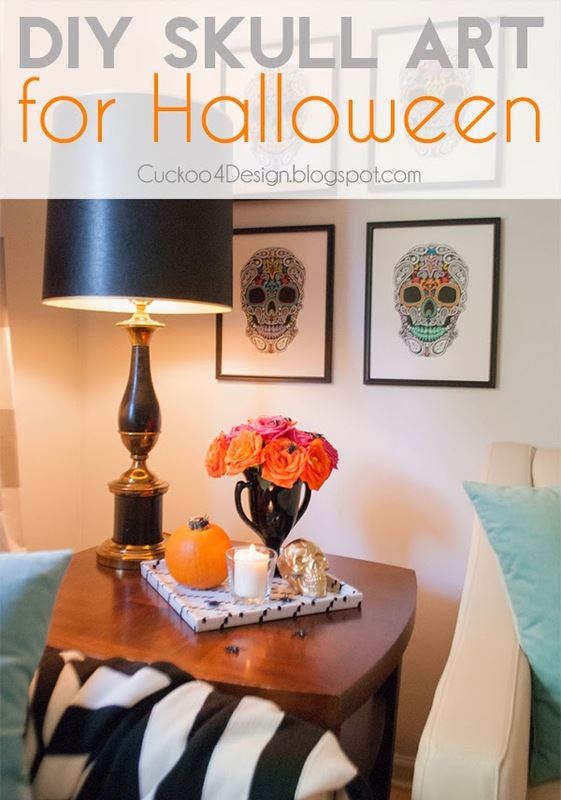 We were asked to complete a Halloween craft project that could be repurposed after Halloween in your home. We were each provided with a gift card to do it. I received my gift card from one of my favorite stores which is Target. Ha, now you know why this project is so exciting to me, right? I wanted to come up with something a little different from the normal Halloween decor and make it a little more colorful. 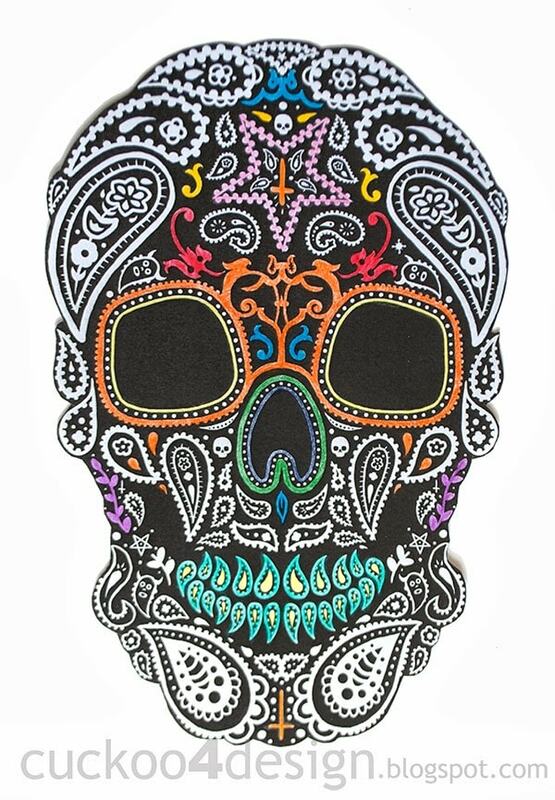 I’m sure you have seen the Mexican artwork and costumes for their holiday “The Day of the Dead”? Creepy but also very artistic and beautiful, at least to me. 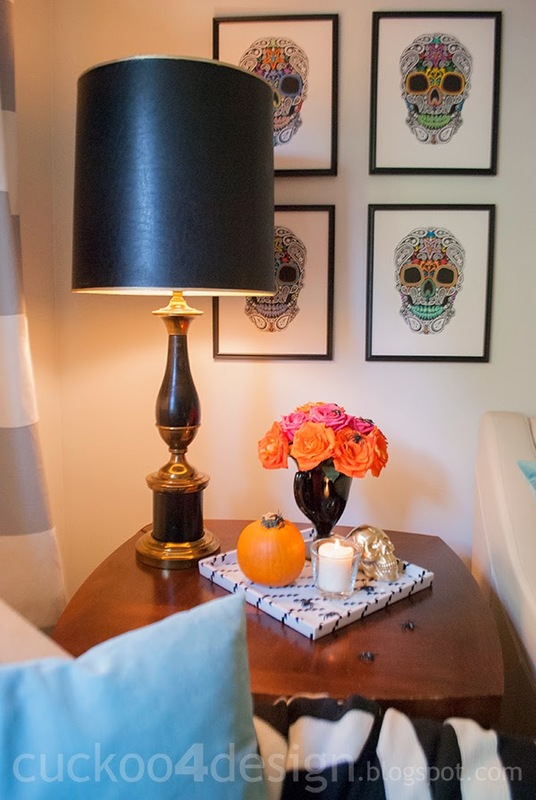 which I ordered with some 11″x14″ frames and a Nate Berkus tray. I used the 15% off home decor item coupon code from coupons.com (click HERE for the Target coupon codes) and the free shipping for $50 spent. 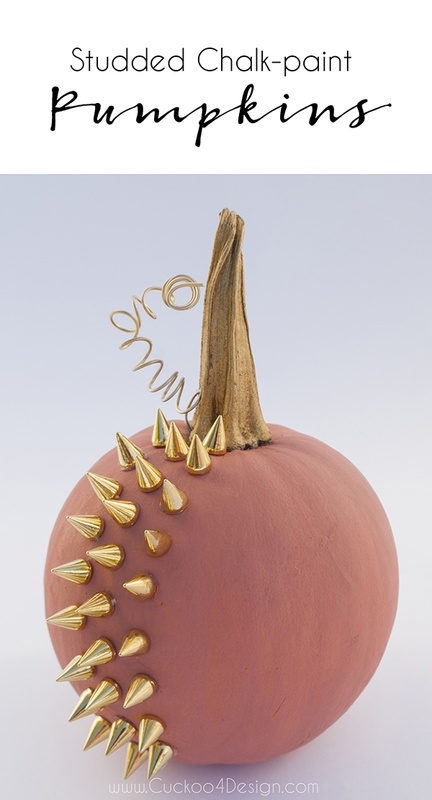 You can also see more Halloween coupons by clicking HERE. I first wanted to copy all kinds of different skulls and artwork out of the book but then decided to stay with one skull that would be colored differently. 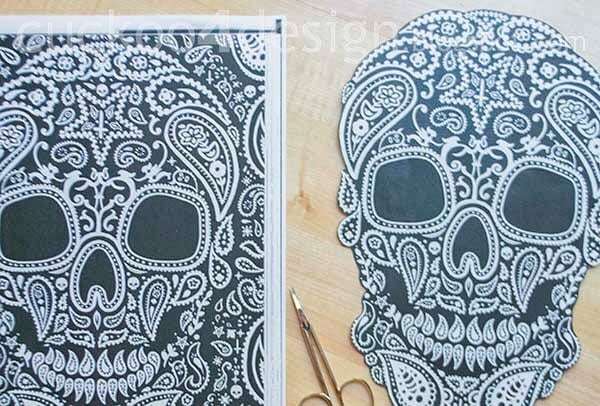 After photocopying the skulls, I cut them out. 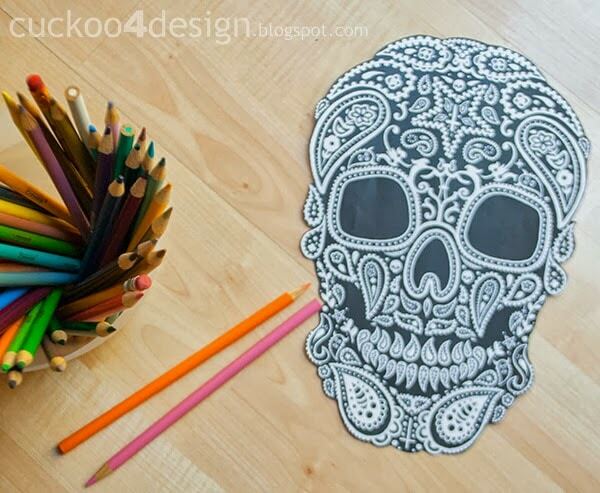 Then my daughter and I had a great time coloring the skulls with some colored pencils. 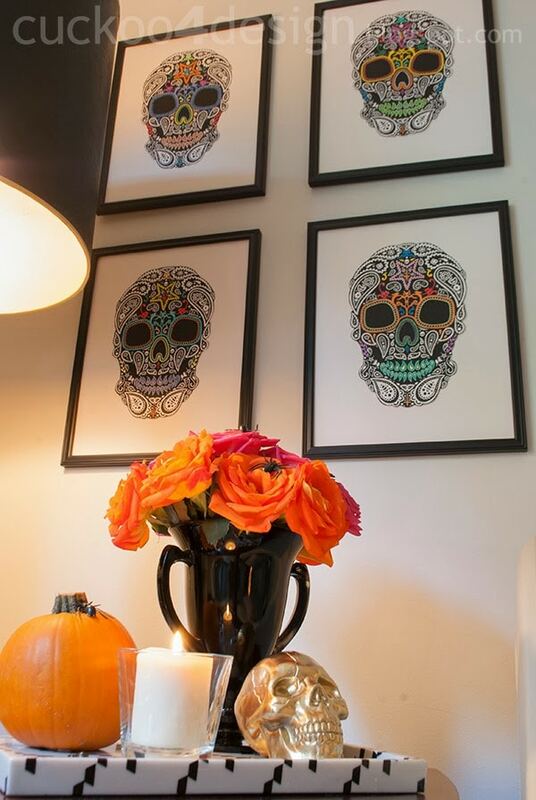 After Halloween we will be using the frames in our staircase hallway where we have a family photo gallery. The book will have a permanent spot on my coffee table. 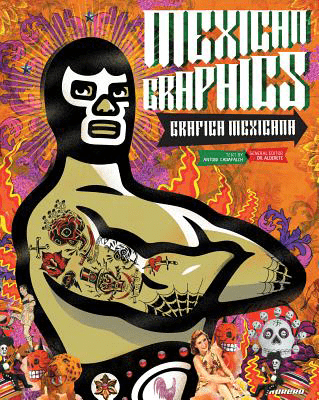 And I’m also thinking about using some of the Mexican wrestler graphics in my son’s room. He wrestles and my daughter is a huge fan of Nacho Libre and Jack Black…don’t ask…I know it’s strange. Not the most common thing to like for a little girl LOL. At least she appreciates a guy with great humor. Should I be worried 😉 ? 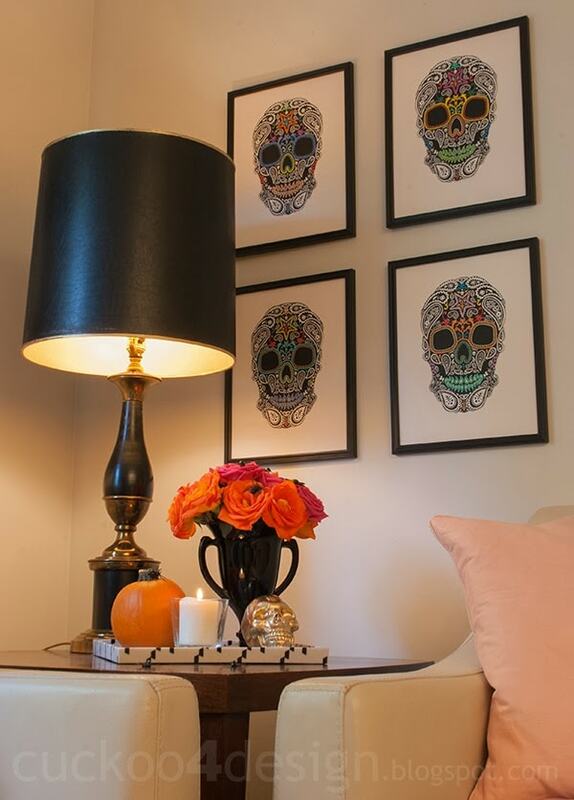 Do you want to see what the skulls look like in our home? 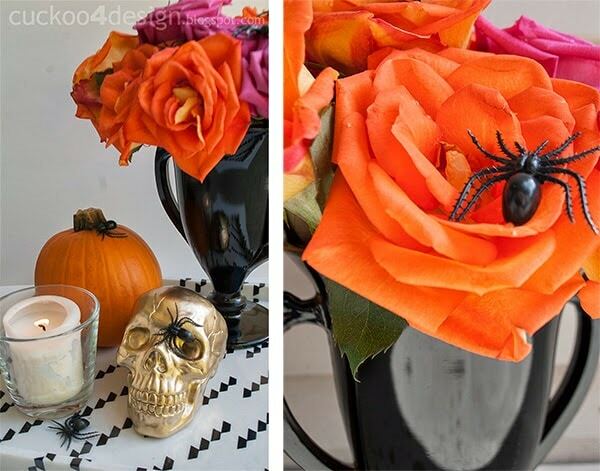 I love how it all came together with the Nate Berkus tray, my $15 craigslist lamp, spray painted gold Target skull, a pie pumpkin, spiders and a $3 thrift store vase for the roses. It turned out so good! I love that you photocopied the pictures and colored them. I would have just ripped the pages out and never though of that. Love that your daughter helped you too! Great job! They turned out really awesome! I love the graphic nature of them and Bethany is right…coloring them really brightened them up and gave them some personality. 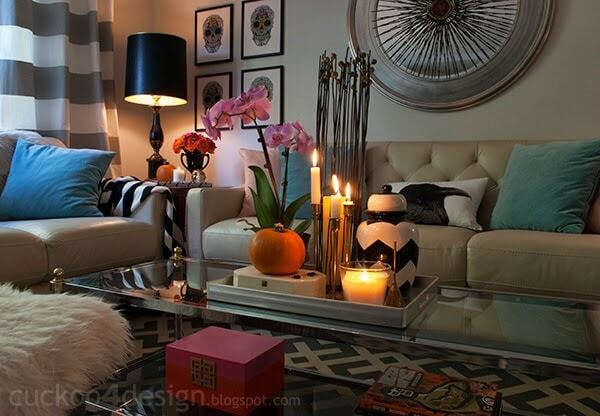 I love them in your living room and that whole vignette you created!!! Well that was clever Julia! They look so cool in that spot along with all your other things.. 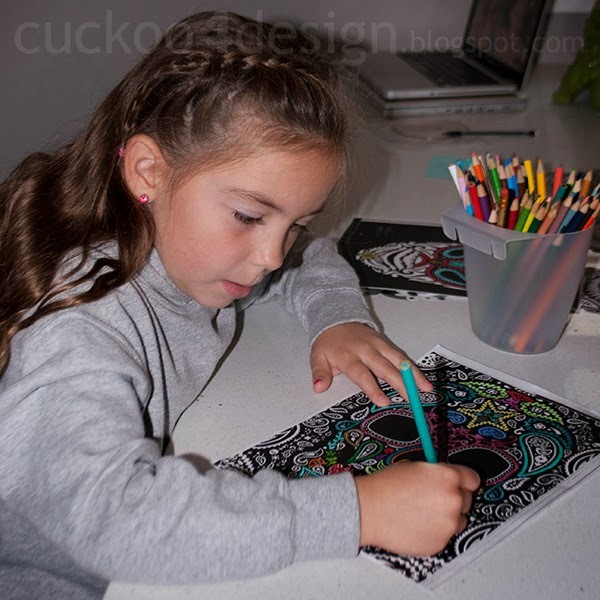 So cute, your daughter looks like she’s really concentrating on coloring them just right! these are AWESOME! 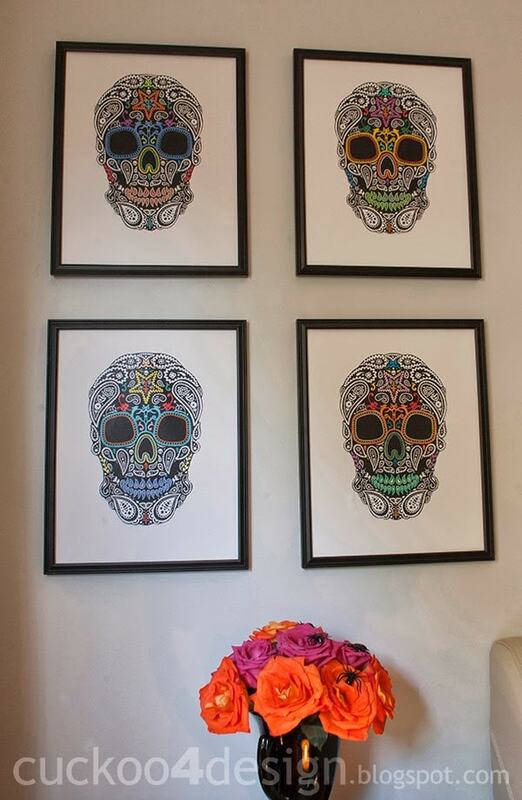 my soon to be sis in law would love these in her home for good, not just halloween, because 1) she loves day of the dead stuff and 2) it’s freaking awesome. Fun project! 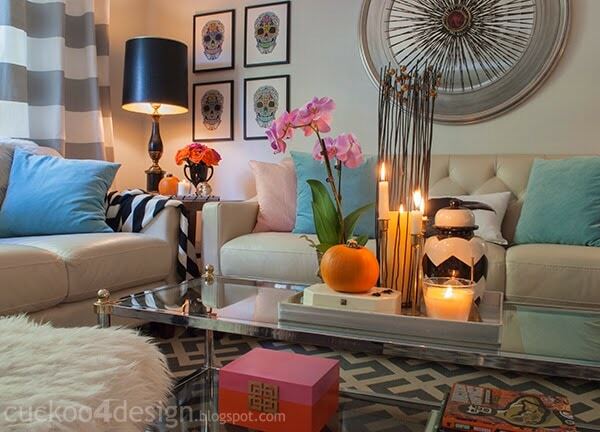 Love the fact that you could even bring in some color with it. 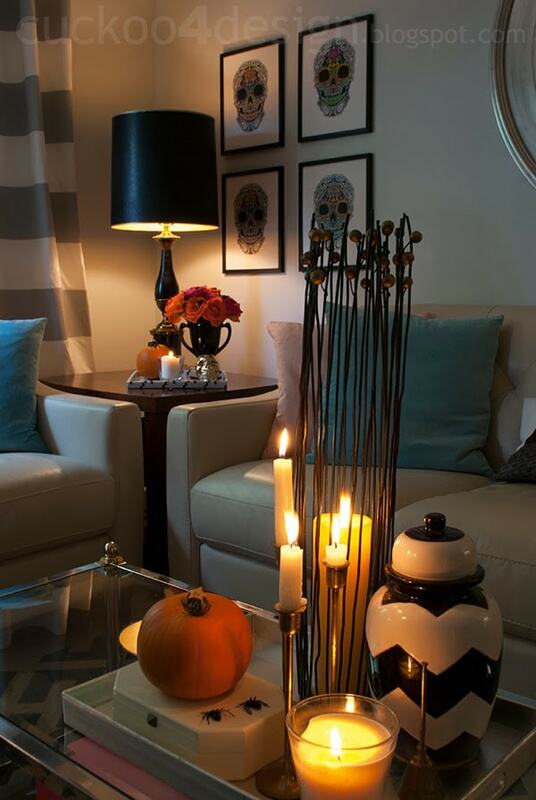 What an awesome and unique way to make seasonal artwork blend into your home. And I love that it’s been colored. Just a great project! 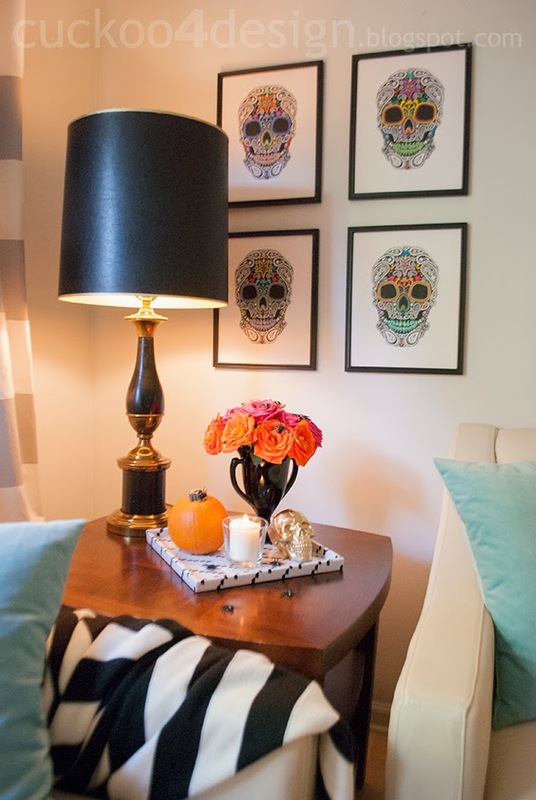 Really love how your daughter added some awesome pops of color to the black and white skulls. And that tray is AMAZING! I’ve checked my Target over and over and they don’t seem to have it…SO mad!! great idea Julia, I would’ve never thought of doing this! also great idea to have your daughter helping you with this fun project 🙂 & of course they look great in your living room too! my brothers would love to have these in their homes! Love your take on this challenge Julia. The skulls are awesome. I love that you got your daughter involved too. Great job! I love that skull. Glad you stuck with 4 colorful version of the same one. It looks incredible! The Nate tray does work perfectly with them! I love this idea. 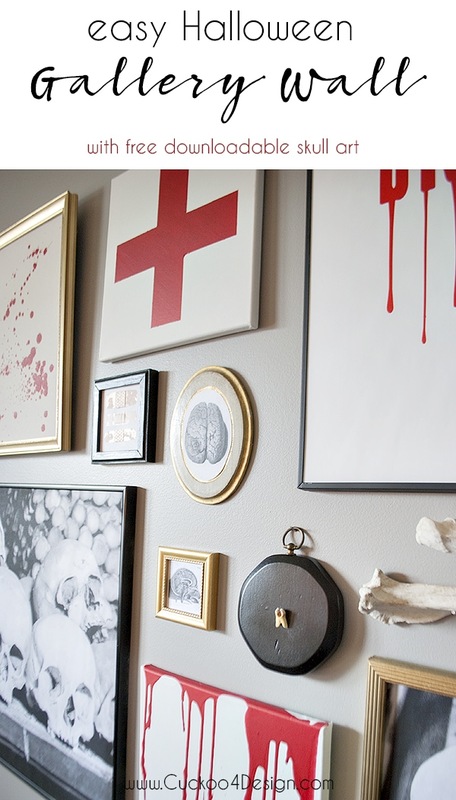 I have all sorts of different skulls in my house but none on the walls. Looks like you have inspired a new decoration in my house. Wow, those pictures turned out fabulous…what a fun little artist you have in your daughter. I love the four hanging together on the wall…great! 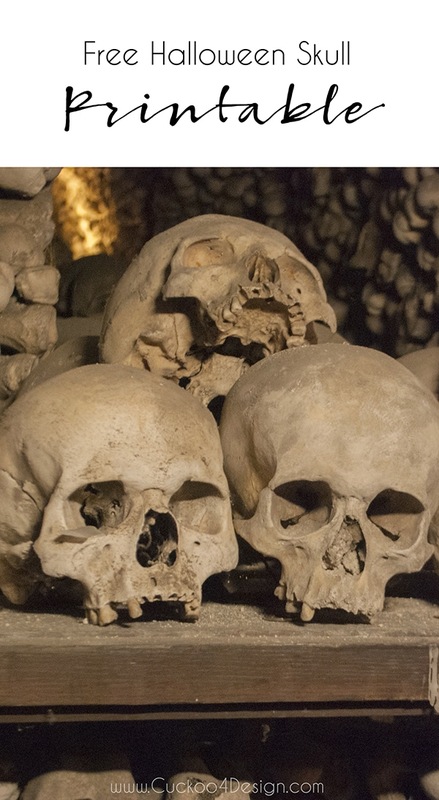 Those skulls are so so cool! I love the bit of color you and your daughter added to them, too! Amazing job!!! Oooo. This is fantastic! 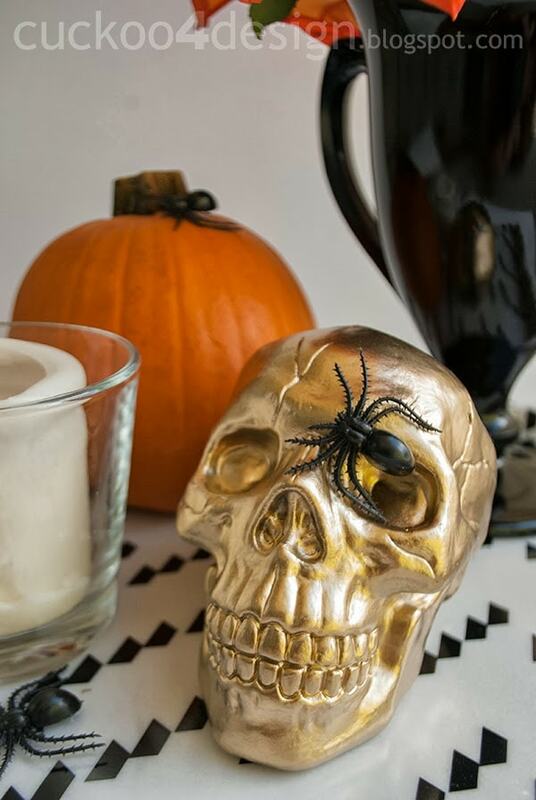 It’s spooky and festive all at once! And chic too. 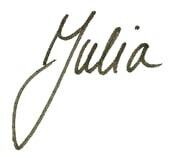 Way to nail it, Julia! Wow! This is so cool. 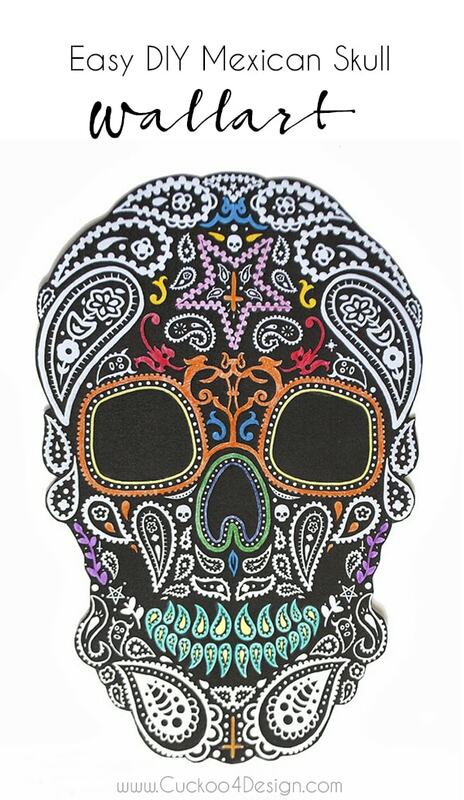 And I really love the skull. It is quite creepy but in a cute way. And this is just in time for Halloween. are the flowers real? 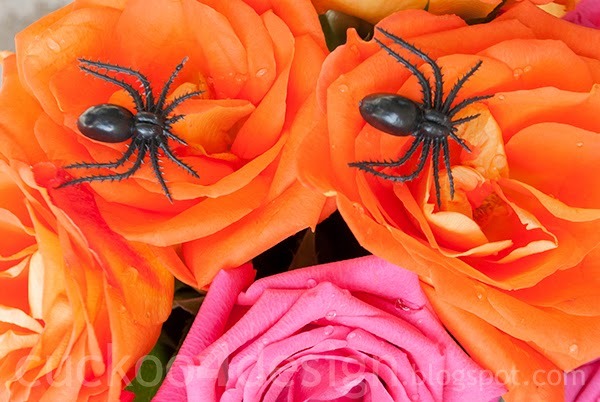 or are they fake flowers with glued on plastic spiders? 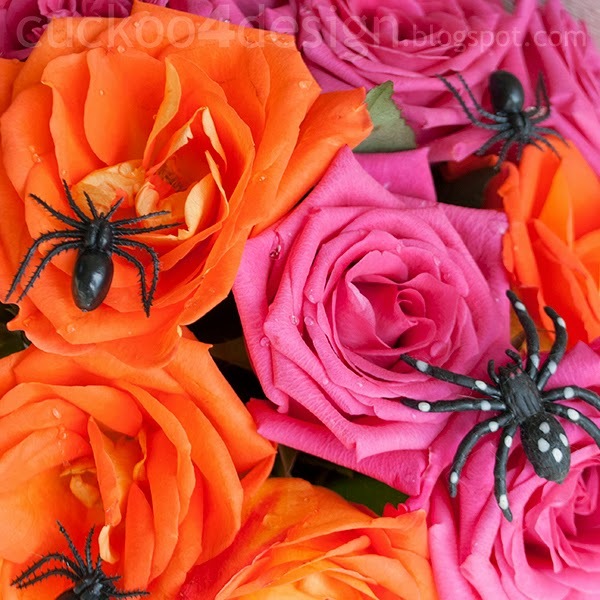 Yes, the flowers are actually real roses and the spiders were from Target and just sit on top of the roses. No glue needed at all!